The impact of Mez‘s unique codewurks [constructed via her pioneering net.language “mezangelle”] has been equated with the work of Shakespeare, James Joyce, Emily Dickinson, and Larry Wall. 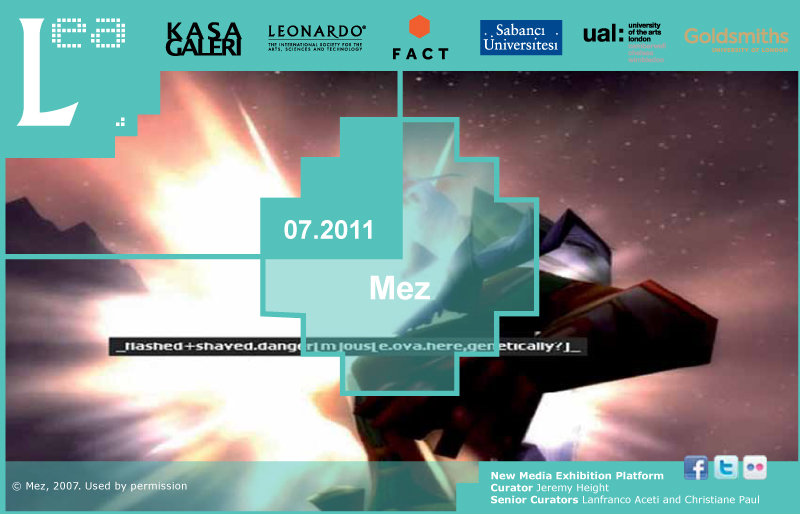 Mez has exhibited extensively since the early 90s [eg Wollongong World Women Online 1995, ISEA Chicago + ARS Electronica 1997, The Metropolitan Museum Tokyo 1999, SIGGRAPH 1999 & 2000, _Under_Score_ @The Brooklyn Academy of Music 2001, +playengines+ Melbourne Australia 2003, p0es1s Berlin 2004, Dissention Convention @Postmaster Gallery New York 2004, Arte Nuevo InteractivA Mexico 2005, Radical Software @Turin Italy 2006, DIWO @ the HTTP Gallery London 2007, New Media Scotland 2008, the Laguna Art Museum California and Alternator Gallery Canada 2009, Federation Square Melbourne 2010 and Transmediale Berlin 2011]. Her awards include the 2001 VIF Prize [Germany], the JavaMuseum Artist Of The Year 2001 [Germany], 2002 Newcastle New Media Poetry Prize [Australia], winner of the 2006 Site Specific Index Page Competition [Italy] and Burton Wonderland Gallery Winner 2010 [judged by Tim Burton, Australia]. Mez was a Vilém Flusser Theory Award 2011 nominee for her article set ‘_Social Tesseracting_’ and is the Executive Editor of the “_Augmentology 1[L]0[L]1_” project, a Synthetic Ecology Strategist, Consultant and Game Theorist.